Caramel-wrapped pretzel rods are a beautiful and unique candy! A thick spiral of chewy caramel is wrapped around a crunchy, salty pretzel, then the whole thing is dipped in chocolate. If you’re a fan of the sweet-and-salty flavor combination, you’ll love this recipe. Have fun dressing up your pretzels to suit the occasion or your family's taste. Chopped nuts are a nice addition, though colorful sprinkles are a ton of fun and an option kids may prefer. You might also choose other toppings found in the cake and candy decorating section of the grocery store. Prepare a baking sheet by lining it with aluminum foil and set it aside for now. Line a small loaf pan (8 by 5 inches) with foil and spray the foil with nonstick cooking spray. Place the unwrapped caramels and the cream in a microwave-safe bowl and microwave for 45 seconds, then stir. If the caramels are not melted, microwave for an additional 30 to 45 seconds, or until they melt when you stir them. Stir until the caramels and cream are completely smooth. Pour the melted caramel into the loaf pan and refrigerate until it sets up, about 20 to 30 minutes. After the caramel sets, remove it from the pan using the foil as handles, and cut it width-wise into 10 equal pieces. Pick up one of the caramel pieces and roll it between your palms into a rope about 6 inches long. Press the top of the caramel rope into the top of a pretzel rod, and wind it around the rod, ending an inch or two above the bottom. Place the caramel-wrapped pretzel on the prepared baking sheet, and repeat with remaining caramel and pretzels. Refrigerate the wrapped pretzels while you melt the chocolate. Place the chocolate candy coating in a microwave-safe bowl and microwave until melted, stirring after every 45 seconds to prevent overheating. Stir until the coating is melted and smooth. 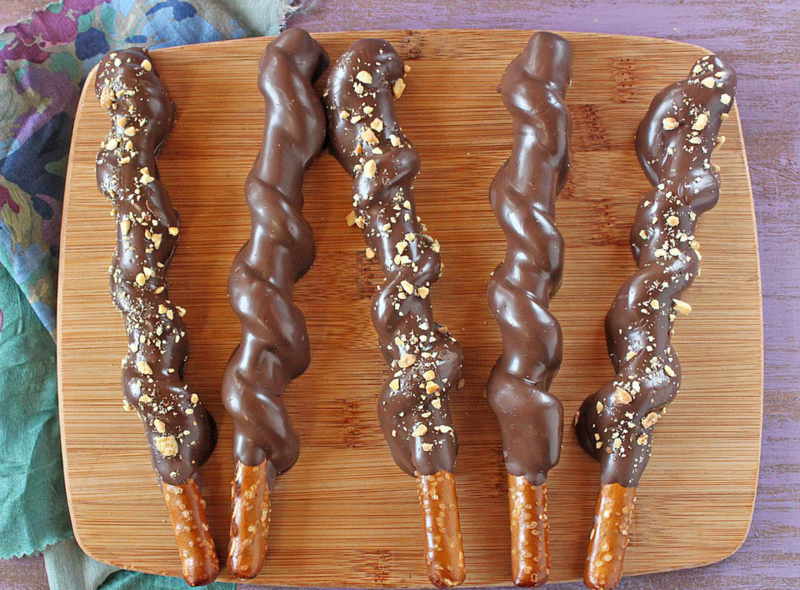 Dip a caramel-wrapped pretzel into the melted chocolate. Use a spoon to pour melted chocolate over it to help you cover any bare patches. Cover all but the bottom 1 to 2 inches of the pretzel rod. You should not be able to see any caramel, although you should still see the twisting shape. Drag the bottom of the pretzel against the lip of the bowl to remove excess chocolate. Place the dipped pretzel back on the baking sheet. If desired, sprinkle chopped nuts or sprinkles on top while the coating is still wet. Repeat with the remaining pretzels. Place the tray with the dipped pretzels in the refrigerator to set the chocolate, about 30 minutes. Store caramel-wrapped pretzel rods in an airtight container in the refrigerator. For the best taste and texture, bring them to room temperature before serving. If you are able to find caramel in a big block, you can cut it into strips and use that instead. Skip the steps for melting and setting the caramel. You can also use caramel that you make yourself, such as this recipe for ​soft caramels. If you do not have a microwave, melt the caramel and chocolate using a double boiler on the stovetop.